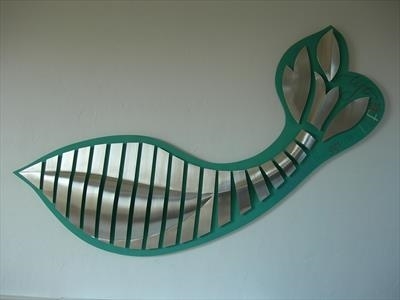 Commissioned for Treliske Hospital organ donation dept.. ‘Life’ is a wall sculpture of formed pewter sheet. Light animates the surfaces as you pass by the contours. The concept is abstract but is reminiscent of many natural things - whale, fish, leaf, ribs, plankton – it’s an organic form, which interprets the ‘life’ force. The Ocean being where life first developed. ‘Life’ is a wall sculpture of formed pewter sheet. Each strip is sculpted with a progression, which develops through the relief to create a sense of time passing. Light animates the surfaces as you pass by the contours. The concept is abstract but is reminiscent of many natural things - whale, fish, leaf, ribs, plankton – it’s an organic form, which interprets the ‘life’ force. The Ocean is where life first developed. There are two veins with a bridge between them and these meet at a point where the line of force changes, increasing in emphasis and rising into a blossoming, flowering form. This is similar to a lotus flower or a bud opening, suggesting new growth and inspiring an uplifting feeling. The whole shape also suggests a computer-generated fractal, bringing it into the 21st century. From Scotland to India this paisley-like pattern can be seen around the world but there is no cultural preference.